Recently I have been let loose to the wonderful world of ebay... it all started when my hubby started selling bits and bobs that were used just once from our wedding (we simply do not have that much space in the house to store it all), and very soon after that, my years of claiming "if I don't stay away from ebay, I will be addicted to it" became history, and my bold claim had turned out to be very true indeed. After buying a couple of vintage sewing patterns from it, I had the most genius idea of finding myself a Singer 99k. Don't get me wrong, my Singer 8280 (Sallie Moonbeam) works perfectly fine, and I did not need a new machine, but who can resist the charms of a vintage Singer? I mean, look at her! It dates from 1957, and I cannot believe how well it has been looked after. It has a motor and foot pedal installed already, and is in great working order. It came with its manual, some (very rusty) sewing feet and its original case - I am one very lucky girl! After spending over 9 years in the UK, I had my citizenship ceremony today. I wanted a dress that is subtly British for the occasion, in that I did not fancy wearing a union jack dress (can you imagine...), but wanted something that is in the right colour schemes to mark the event. 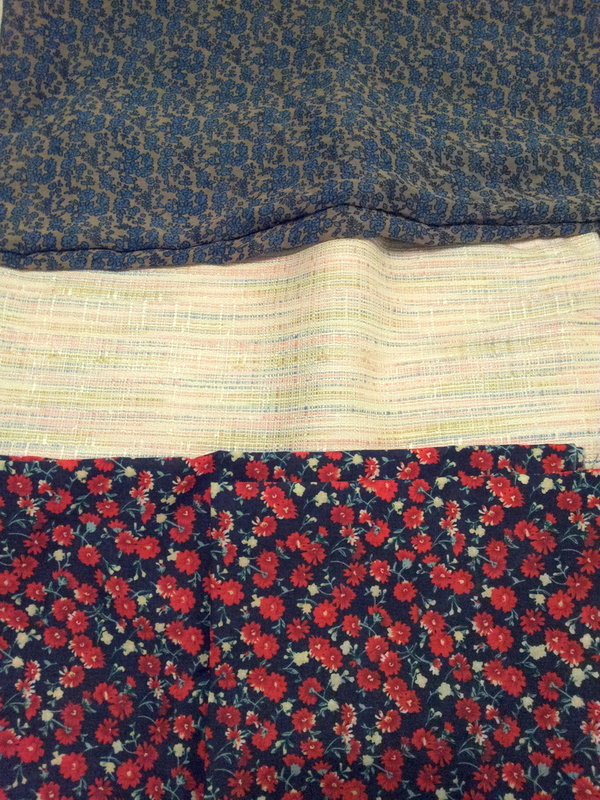 After searching for the right fabric for a few weeks, very luckily the lovely Helen brought a beautiful blue and red floral polycotton (pre-washed and everything - thank you!) 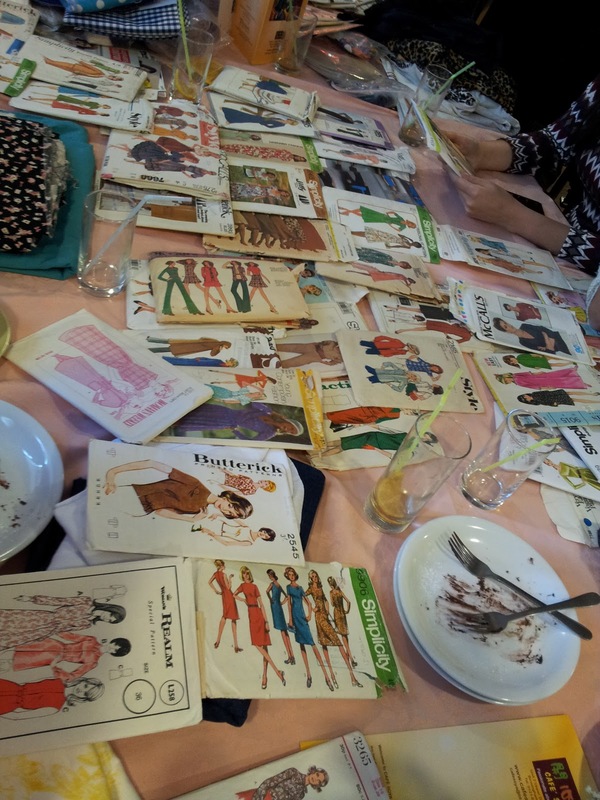 to what could only be the biggest ever swap at the blogger meet-up last weekend. I wanted a reasonably smart looking dress for the occasion - it was indeed a serious ceremony, so I wanted to dress the part without looking too business-like or "disco". 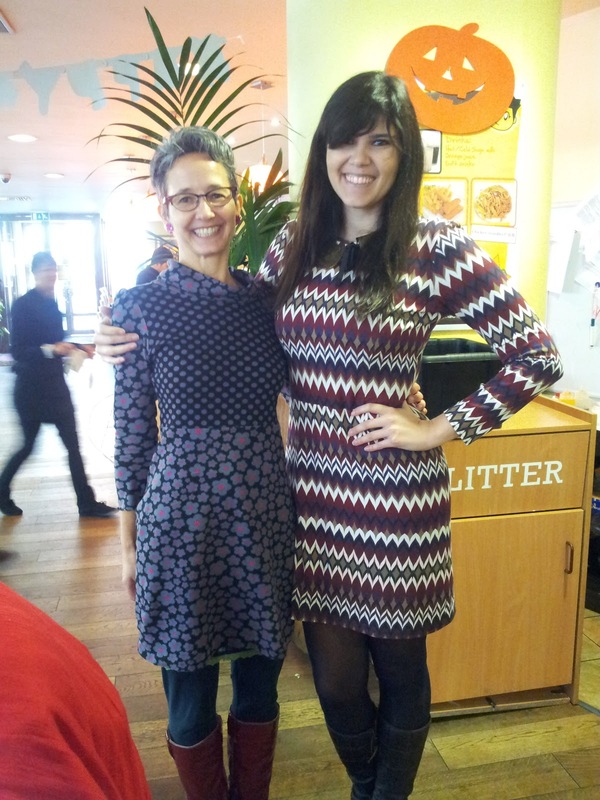 So I decided to give Simplicity 1798 a go, which is a Project Runway pattern from the Autumn 2012 collection. I bought this pattern pretty much as soon as it came out, as I was drawn to its lovely silhouette the reglan sleeves and the notched neckline (unfortunately not so much the peplum, despite being a huge fan of peplums in general). So I made just that! It's a view A bodice with reglan sleeves. Originally my ceremony was going to be in December, but as there was a last minute cancellation, my space was moved to today - this gave me little time to pull this all together, especially as I was away in the weekend. But a couple of evenings later, it is done! I cut a size 4, which is what I normally do with Project Runway patterns, but it turned out a bit small. Either I expanded in the last few weeks (which is highly likely, given my um, increased food intake in colder weather), or this pattern runs small! Obviously I have not got a 22 inch waist, but I usually find that the design and wearing ease included in a pattern is a bit excessive, so I would typically cut a smaller size. I didn't need to let out the side seams thankfully (the midriff band complicates matters), but I did use a rather narrow seam at the back when inserting the zipper. I also made a tiny SBA to this princess seamed bodice, which was super easy. 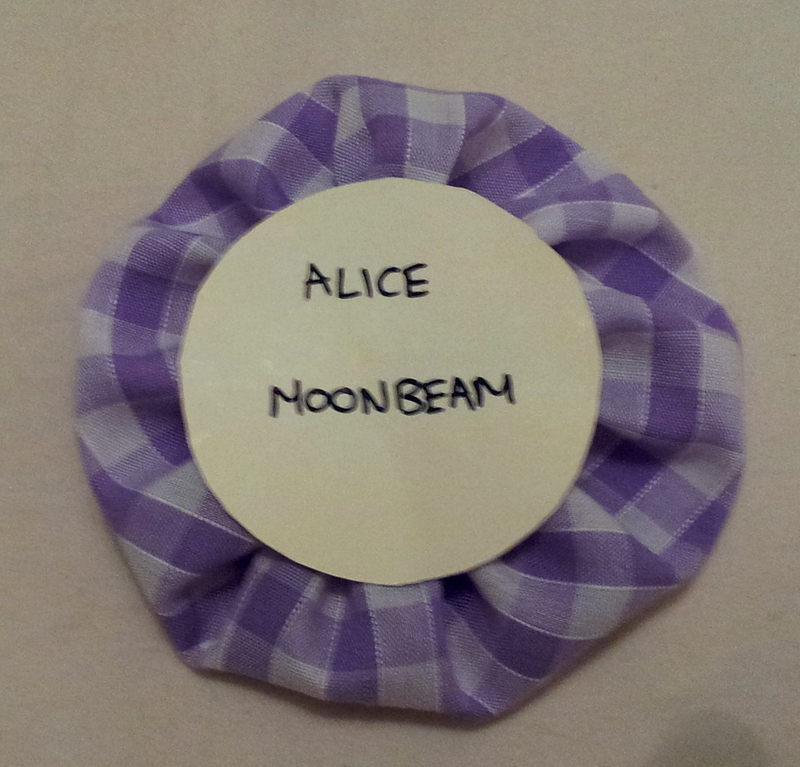 The only other alteration I made was that I shortened the skirt by 6cm so that it finishes just above my knees. This pattern did not disappoint. The dress turned out to be everything that I wanted (albeit a bit tight... so tiny breaths), and I just love the neckline. It was easier to make than I thought, too, and the facing stays in place and is extremely well-behaved. What more could I ask for? The Registrar, me, and the Queen (she was there in spirit!) - doesn't the dress go perfectly with the flag in the background? Hello my lovely readers, did you have a nice weekend? I am proudly reporting back from my Birmingham trip! 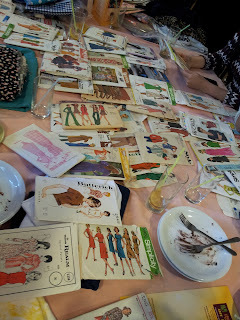 If you read my shopping list last week, you would recall that I went to my first-ever real-life sewing blogger meet-up on Saturday! After combating a few "are you sure this is going to be safe?" "what if it is a scam", etc etc, I went to Birmingham New Street Station full of overwhelming excitement, on Saturday morning in the drizzling rain (what are the odds?). 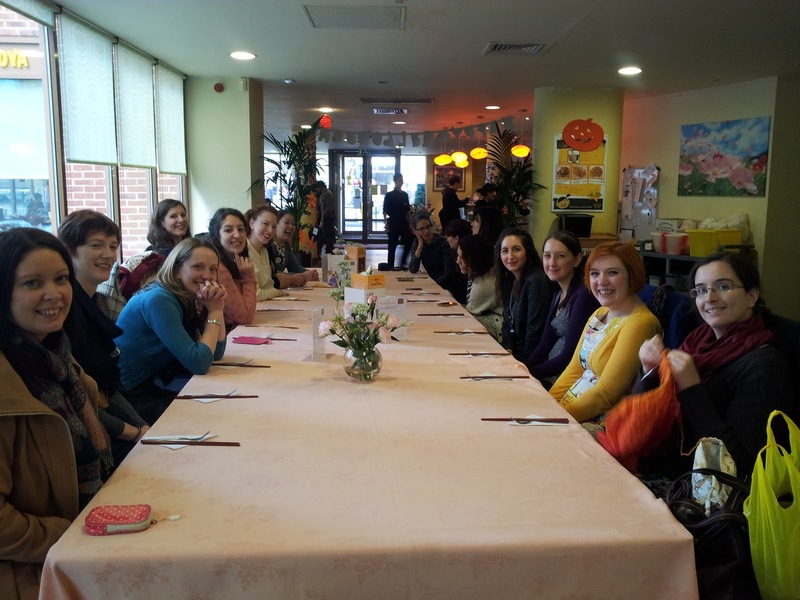 I was welcomed warmly by all the ladies (okay... I may have been one of the last people to arrive at our meeting point) and a super cute name badge! I was also given some delicious chocolatey treats, which, of course I would've taken a picture of had I not eaten them all rather quickly. Our first stop was the outdoor stalls of the Rag Market, as the sun had come out by that time, and we weren't going to bank on it staying out. What a great spot! 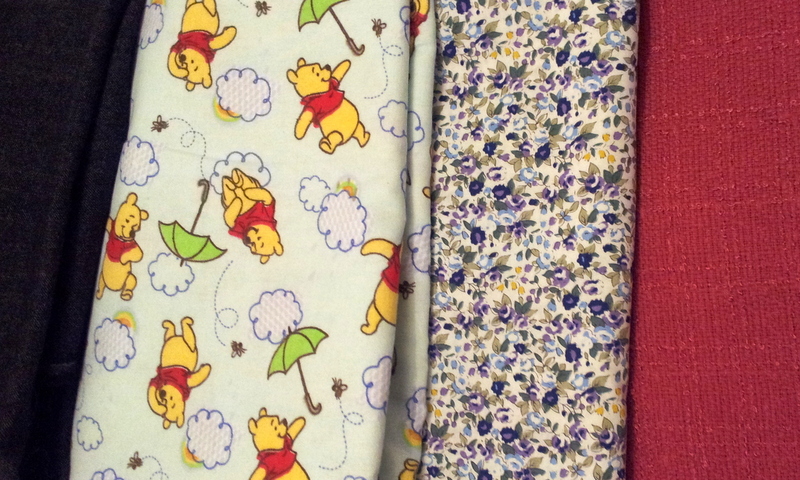 We found lots of fabrics for between 50p and £6 a metre, and I made my first purchase pretty quickly. It was a beautifully soft grey wool for £5 a metre, and I bought 1.75 metres which should be enough for a smart work dress. Shortly after I snapped up 2 metres of a dark red/burgundy thick polyester (crepe?) at £2.5 per metre. The indoor stalls weren't that much more costly either. In fact, I managed to get 1.5 metres of hot pink/fuschia polyester (another thick wintery fabric) at £2 per metre. So far so good - I managed to stay away from anything floral (I am naturally drawn to floral fabrics, so I think it took great strength to drag myself away from them) - all the bits I bought were actually rather plain, which is what I needed. Karen from Did You Make That? Can you believe that Rachel and Winnie used the same pattern to sew their dresses? And this is what I ended up... all for free! Before I forget, from top left and clockwise, they were gratefully received from: Katie, Marie, Mellie, Claire, Claire, Suzy and Katie. I also got the lovely grey/blue floral chiffon from Kat, a pale wool/blend (the picture really does not do it justice) from Karen, and the floral blue polycotton from Helen (from SewStylish). Yep, that's where the florals came in!! I just could not resist them. 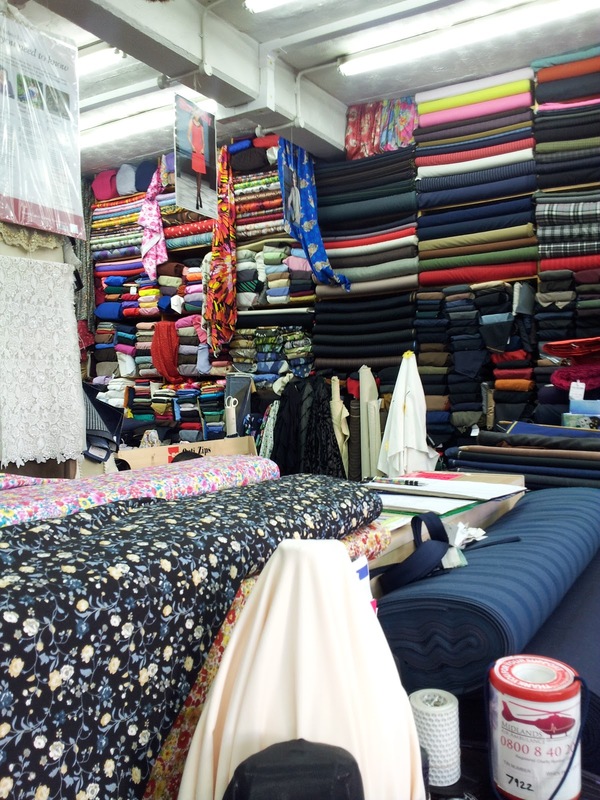 After lunch, we kept calm (though I must admit, it took me a while to calm down from all that excitement) and carried on fabric shopping! We went to the Fancy Silk Store, where I finally found the perfect bridal satin for my mother-in-law's bolero (only at a reasonable £8 a metre). The funniest thing was, the shop owner was so surprised and taken by the size of our group, and how far some of us had travelled to visit his shop (amongst others), he gave us a free pen each! AND THEN, we went to a warehouse type of place, called Barry's Fabric Superstore (no kidding!) which was A-M-A-Z-I-N-G. 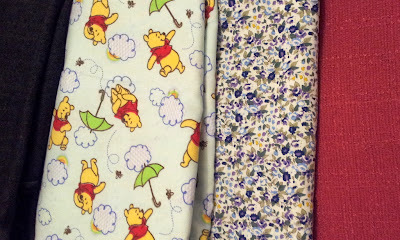 Here I found the Winnie the Pooh fabric, for one of the baby blankets, and some purple/lilac florals (oops!) which I bought to make either name badges or some sort of personal effect for my mother-in-law's upcoming hen do in January. 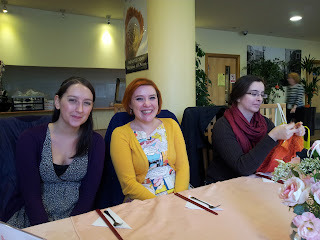 Right, before I ramble on for any longer, here's another photo with part of my swag from yesterday. I just wanted to say once again that thank you so much for organising such a perfect day yesterday, Marie and Kat! It was so great to meet everyone (all 14 of you!) and I'm sure we'll see each other again soon - but until then, I shall be following your blogs (but not in a stalker-ish manner...)! Wool/tweed for Vogue 3007 - from the early 60s. Look at all the beautiful variations! I'm sewing in my head already! Since my body is built like a child's, I may as well buy some medium weight cotton for this school uniform pattern (and shhhh it may also be a child-sized pattern!). With a solid coloured fabric, I think I can make view 1 "work-worthy"! 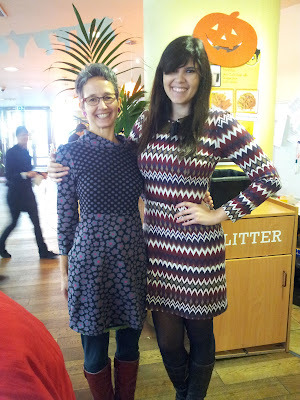 I can't wait to make the next pattern, Simplicity 5968 from 1965 - I love view 1, especially with its detachable collar. view 2 would make a perfect jumper dress worn over a top though - great for the colder days. For my first go I will need some sophisticated looking relatively stiff/heavyweight cotton/wool or a blend. Another single-toned warm-ish (wool?) fabric needed! This is for my Marian Martin 9433 below - from the 70s. I think this is a very versatile pattern, but with the weather as it is, it is a challenge to think about the warmer days and summer fabric. Now time for what I need for my modern patterns. 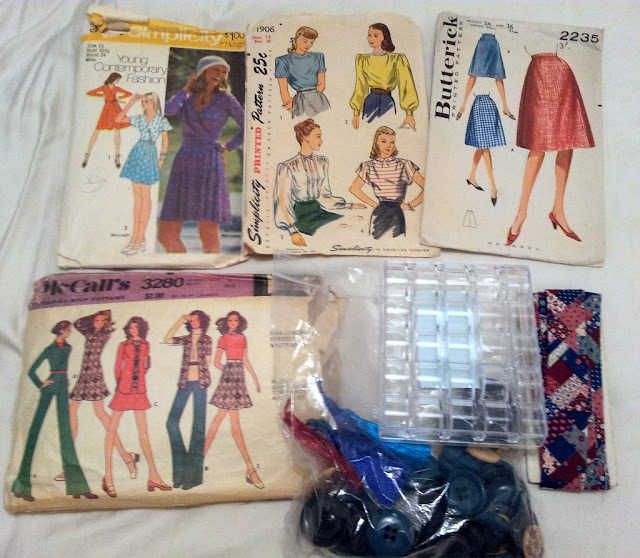 I need more wool/tweed for view A of Simplicity 1754 - how I love Project Runway patterns! And I still need to colour-match some satin for my mother-in-law's bolero. Yep, I'm bringing my tiny sample from the lace-up tie of her wedding dress to find the right fabric. I've struggled with/touched/rubbed the tiny sample for so long, I am almost certain that it has got a little bit darker (dirty) than it really is... But I shall be using Butterick 4731, a view B bolero with the long sleeves. Have you got enough on your list? I hear you ask. Umm no, I actually have not... 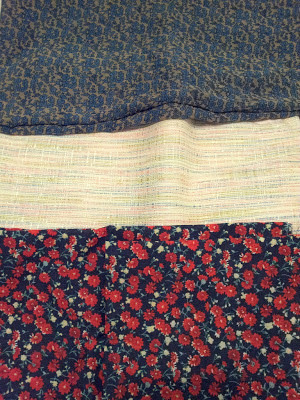 In fact, I will also be looking for 2 pieces of boy-girl neutral looking cotton to make 2 more baby blankets. What happened to wanting to find out whether the baby is going to be a boy or a girl? Both of my pregnant friends (something is in the water!) have decided to wait for the wonderful surprise - but on a selfish note that just makes picking fabric for their baby blankets so much harder (and yes I may have encouraged them to find out...)!